Fishers Tours Limited T/A Fishers Tours is committed to a policy of fair trading and will take every care to give you value for money and ensure that everything is done to the satisfaction of the hirers and their passengers, but in your own interests you are advised to read these conditions which set out the principal rights and liabilities we owe to each other. ‘Passenger(s)’ means the person or persons being carried by the company vehicle. Confirmation of Hire – Written confirmation by the Company is the only basis for the acceptance of a hire or contract. Any verbal agreement of amendment must then be followed up by written confirmation of the change by the Hirer. Cancellation by The Hirer – a) Cancellation more than 5 working days prior to the hire or contract – £50 per vehicle hired. b) Cancellation less than 5 working days prior to the hire – 50% of the total hire charge. c) Cancellation on the day prior to the hire – 75% of the total hire charge. d) Cancellation on the day of the hire – 100% of the total hire charge. e) Upon cancellation the hirer will also be liable to pay for any additional items or services that have been bought and paid for on behalf of the hirer in advance of the hire. For example, ferry services, theatre tickets, meals, parking permits, accommodation etc. Every effort will be made by the company to reduce this liability however all non-retrievable charges will be the responsibility of the hirer. If hirer wishes to transfer hire date a charge of £25 will occur and has to be paid prior to date of hire. Cancellation by the Company – In the event of any emergency, riot, civil commotion, lock out, stoppage, restraint of labour, force majeure or on the happening of any event which the Company has no control over (including adverse weather and road conditions) or in the event the hirer taking any action to vary agreed conditions unilaterally, we may return all sums to you and cancel without any further or other liability to you. Payment Terms – A non-refundable deposit of £50 per vehicle is payable at the time of booking, unless the date of your hire is less than 5 working days away, where the full cost would be due when booked. If accommodation is needed, 25% of the hire as a non-refundable deposit is to be paid instead of £50 per vehicle to cover the costs of accommodation. The balance of the hire charge is payable 5 working days* prior to the date of hire unless other payment terms are agreed. Payment is to be made by cash, credit or debit card, cheque, or bank transfer only. *Cheque payments are to be received 10 working days before the date of hire and our bank details are stated on all our invoices. (The company reserves the right to decline any work when the foregoing condition has not been adhered to, in which case the deposit becomes forfeitable by the hirer to the company). Parking charges – The Company is not liable for any parking charges. Parking charges are to be paid by the hirer on the day of travel. Use of the Vehicle – The hirer cannot assume the use of the vehicle between outward and return journeys, nor that it will remain at the destination of the hirer’s use unless this has been agreed with the company in advance. The hire details regarding arrival and departure times and any additional pick-ups or drop offs are defined on the Driver’s Work Ticket, this is exact information provided on booking confirmation. Only what has been agreed will be carried out. Seating Capacity – The Company will, at the time of booking agree and specify the legal seating capacity of the vehicle. The hirer must not load the vehicle beyond this capacity. Passengers’ property – Luggage may only be carried in the seating area if it will fit safely in the overhead lockers. The operator will not accept liability for any damage to or loss of any property left on a vehicle by a passenger, or whilst on the vehicle. All articles of lost property recovered from a vehicle will be held at the depot at which the vehicle is based for a period of one month. Lost property has to be collected from our depot and will not be delivered. If requested, lost property can be mailed and the charges for this must be paid for in advance of items being sent. Vehicle Provided – (a)The Company reserves the right to provide a larger vehicle than that specified at no additional charge. (b) The Company reserves the right to substitute another vehicle (including those of other operators) subject to substitutes being of similar quality. Breakdown and Delays – The Company gives its advice on journey time in good faith. However, as a result of breakdowns, diversions, adverse weather conditions or traffic congestion, or other events beyond the reasonable control of the company, journeys may take longer than predicted and in those circumstances the company will not be liable for any loss or inconvenience suffered by the hirer as a result. Driver’s hours and rest periods – The hours agreed with the Company for the operation of any hire must be strictly observed (other than in the case of serious emergency or diversion) so that current regulations governing drivers’ hours and rest periods can be complied with. The operator reserves the right to curtail or otherwise alter any hire, which does not comply with the relevant regulations. Animals – No animals (other than Registered Assistance Dogs) may be carried without the prior agreement of the Company. Alcohol – No alcohol is permitted to be carried or consumed on the vehicle without the prior consent of the operator. Smoking and drugs – The use of illegal substances, smoking including vaping and any other electrical cigarette is not permitted on any vehicle at any time. Conduct of passengers – The driver is responsible for the safety of the vehicle. Any passenger whose conduct is in breach of statutory regulations or is otherwise considered by the driver to be unacceptable may be removed from a vehicle or prevented from boarding on the driver’s authority. The hirer will be responsible for the conduct of passengers and for any damage caused to the vehicle by passengers during the hire. Damage and soiling – The hirer is responsible for any damage or soiling caused to the vehicle by any passenger for the duration of the hire. A minimum surcharge of £100 will be made if the vehicle is damaged or soiled. This surcharge will be invoiced the next working day and this is the responsibility of the hirer. If the extent of the damage or soiling is such that the vehicle is out of service for any period of time the operator may in its absolute discretion surcharge the hirer a minimum of £500 per day or part of a day for which the vehicle is out of service. Any such surcharge is payable upon demand. Data Protection Act (2018) – All your personal information is kept safe and secure and up to date. We do not keep your credit card information on file and we do not share your personal information with any other Companies or individuals. 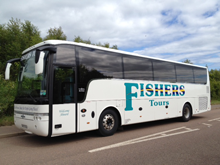 Complaints – Any complaint in respect of services provided by the company should be made in writing to the company office or emailed to enquiries@fisherstours.co.uk within 14 days.